Cruising along Highway 101 on Oregon’s Central Coast — climbing over imposing headlands and winding past miles of misty beaches — ranks among the most memorable road trips in the Pacific Northwest. But there’s an equally stunning way to see this craggy stretch of shoreline that doesn’t require setting foot on the gas pedal. A clean, reliable network of public transit connects travelers starting in Portland to the artsy and eminently walkable city of Florence, a colorful fishing port that packs galleries, antique shops and fish markets into its restored Old Town. 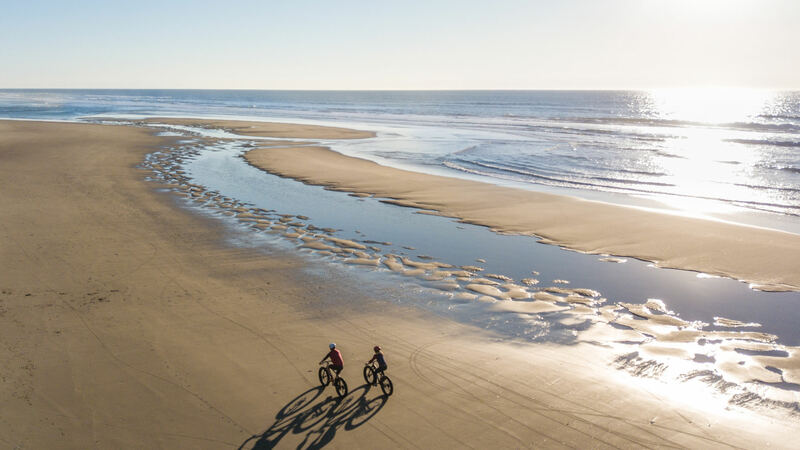 With at least three days on your itinerary, you can explore the historic riverfront district and even make a few side trips to soak in otherworldly views of the Oregon Dunes. Oregon’s intercity system of buses makes this trip easy. It’s just 3 hours and 35 minutes of road time from Florence to Portland (and vice versa), not counting a transfer in Eugene. Make reservations for the comfortable, Wi-Fi-enabled Bolt Bus, running multiple trips per day between Portland and Eugene; board the bus in Portland’s Pearl District (on Northeast Everett Street at Eighth Avenue) for the 2-hour-and-20-minute trip south. The Bolt Bus will drop you off at the 5th Street Public Market in Eugene, from where it’s a 5-minute walk to the Eugene Amtrak Station downtown. Pacific Crest Bus Lines services the afternoon ride from the Amtrak station to Florence every day. Once in Florence, the Lane Transit District’s Rhody Express provides weekday bus service in the Florence area, though it does not operate on Saturday or Sunday. Conveniently, the River Cities Taxi can take you to destinations within and around Florence. The taxi is your one chauffeur for day trips. Extend your trip: Budget a few extra days to explore Eugene on your way to the Oregon Coast. The Bolt Bus drops you right in the center of the city, making it easy to experience this hub for counterculture and athleticism. Find ideas for a car-free Eugene detour here. Book accommodation in walking distance of Florence’s downtown so that you can explore the compact city center on foot. You can’t get more central than the waterfront River House Inn, where most of the modern rooms have views of the Siuslaw River. Across the street, stay in one of six antique-filled rooms at the Edwin K Bed & Breakfast, housed in a restored 1914 Craftsman-style home. For more walkable options, try the unassuming and economical rooms at Landmark Inn, Lighthouse Inn and Old Town Inn — all mere minutes from the Old Town area’s restaurants and shops. 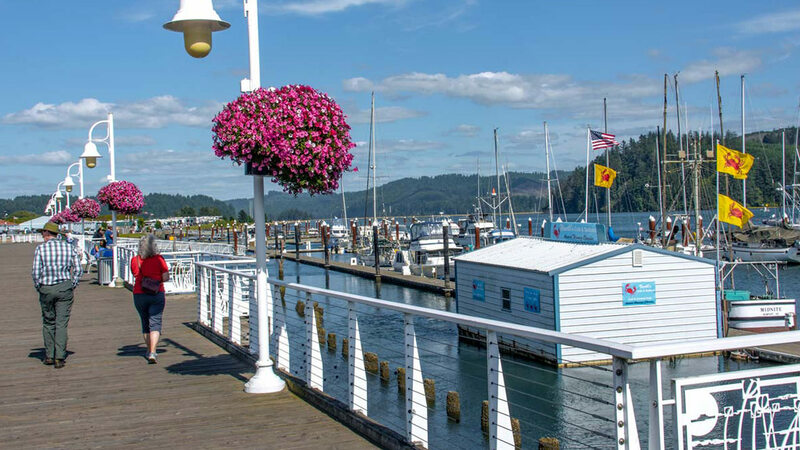 For campers toting along a tent, the quiet Port of Siuslaw Campground & Marina has 105 sites adjacent to First and Harbor streets. In the shadow of the art-deco Siuslaw River Bridge, several blocks of renovated early-19th-century buildings form Historic Old Town. It’s a neighborhood meant for browsers, with a cluster of galleries and boutique shops. Dedicate at least an afternoon to popping into eclectic storefronts like the aptly named Wizard of Odds, where crowded shelves hold laser-cut masks, treasure boxes and mythical figurines. Or grab a best-selling page-turner and flip through hundreds of secondhand tomes at Books ’n’ Bears. Venues such as the ocean-themed Blue Heron and co-op Backstreet galleries give you a glimpse of the small-town art scene; pick up the Florence Arts Passport for a complete overview of the cultural offerings in this creative coastal community. 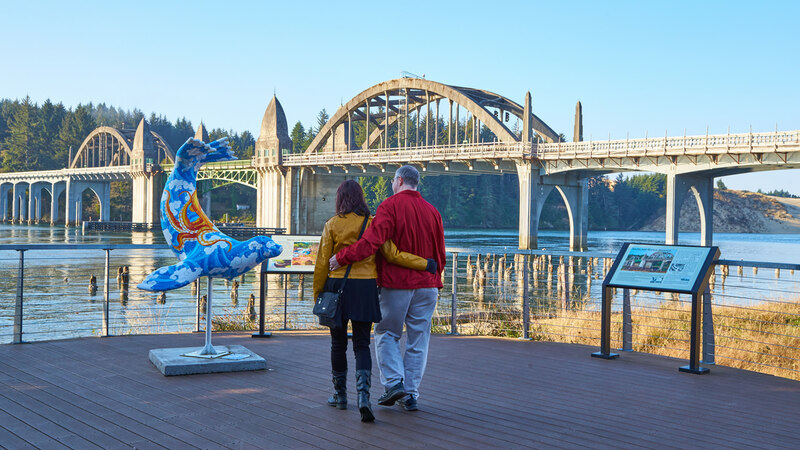 Grab a coffee at River Roasters and head to the Siuslaw Interpretive Center, a viewpoint area with benches, picnic tables, and ADA-accessible paths overlooking the river, estuary and bridge. Ocean to table is the way of life in Florence. The locavore food scene here is all about seasonal ingredients and the catch of the day. For the freshest seafood from local fishers, head to an old-school fish market such as the Krab Kettle, an institution since 1962 that’s famous for its Dungeness crab, regional oysters and house clam chowder. You can’t get much closer to the source than Novelli’s Crab & Seafood, a floating seafood shack on the docks where a commercial fishing family serves only what they catch themselves; try their hearty crab-chowder bread bowl. Regionally sourced and organic produce drives the lunch and dinner menus at Homegrown Public House. Homegrown’s kitchen happily caters to plant-based diets with standout dishes such as the vegan hemp-seed burger on a gluten-free roll, served with house-fermented kimchi. The atmosphere at the upscale Waterfront Depot feels like a good friend’s dinner party, where rich comfort-food classics pair with an excellent list of Pacific Northwest wines; reservations are recommended. At the go-to watering hole since 1936, the Beachcomber Pub, 20 taps of craft beer flow until midnight — including the signature Barnum’s Honey Brown, a collaboration with Rogue Brewing. Florence is the gateway to the largest expanse of coastal dunes on the continent. 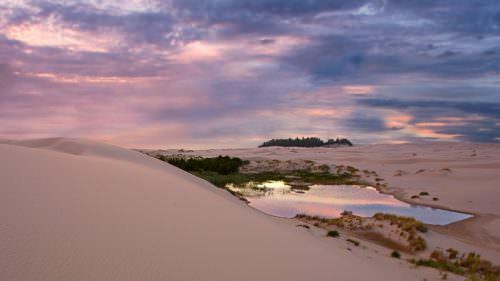 The Oregon Dunes National Recreation Area encompasses lakes, rivers coastline and dunes, some towering as high as 500 feet above sea level — a 40-mile stretch of windswept sand where hikers, ATVs, equestrians and even sandboarders explore the ever-shifting landscape. 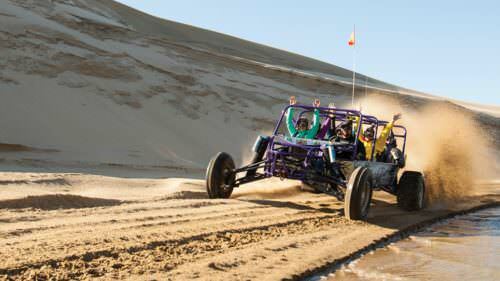 Take a guided tour with Sandland Adventures (5-minute cab ride south of Florence) in either a speedy sandrail or a more relaxing giant dune buggy. 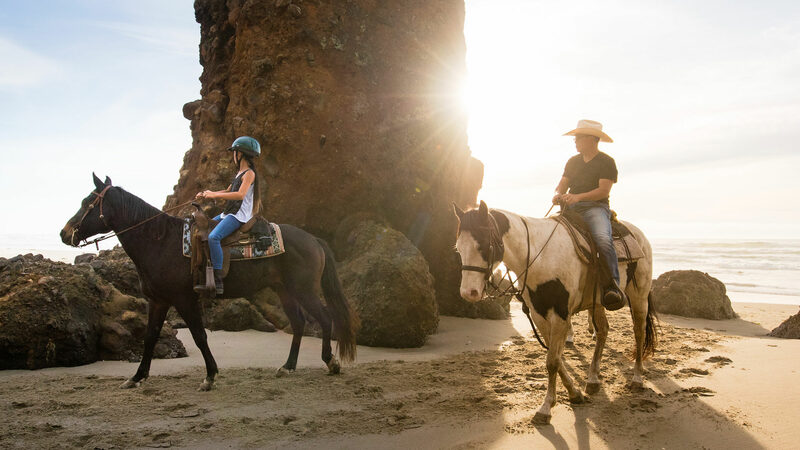 Or trot across the dunes on horseback with C&M Stables (15-minute cab ride north of Florence), which offers a variety of tours suited to different skill levels and ages. 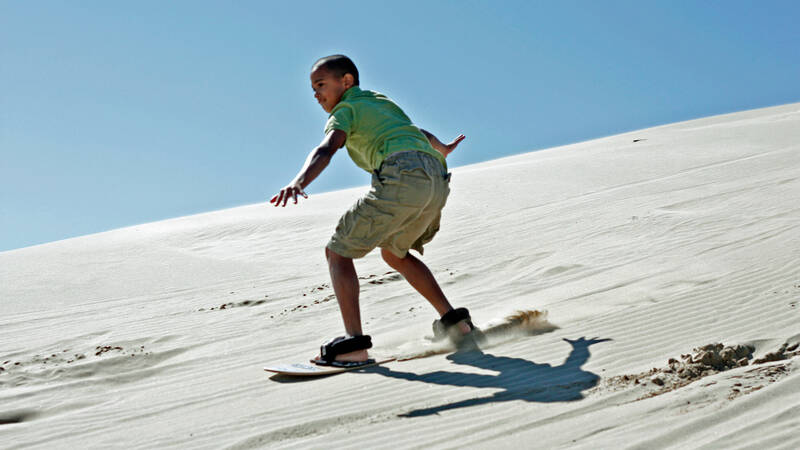 For a different kind of thrill, try sandboarding — think snowboarding with sand. You can take lessons and rent gear at Sand Master Park in Florence (8-minute cab ride north of Old Town), which dubs itself the world’s first sandboard park. Adjacent to the Oregon Dunes National Recreation Area lies one of the Oregon Coast’s largest and most popular parks. Just inland from the ocean, Jessie M. Honeyman Memorial State Park is famous for nonmotorized access to miles of sandy dunes. Hikers can access a system of easy hiking trails that wind through the fast-changing scenery of coastal forests, freshwater lakes and steep dunes that are popular with sandboarders. The park has two lakes — Cleawox and Woahink — that are popular for swimming and paddling. From Memorial Day to Labor Day, you can rent canoes, kayaks and stand-up paddleboards at Cleawox Lake. If you want to stay the night, the park’s campground has more than 300 sites, including 10 rustic yurts. Honeyman State Park is a 5-minute cab ride south of Florence. 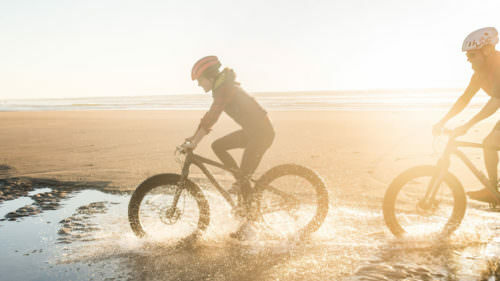 Check ahead — The Oregon Coast is a year-round destination, but many believe it’s best experienced during fall, winter and spring when crowds thin. Even so, some coastal businesses operate limited hours during off-peak months, so be sure to call ahead before setting out. Cab services — Tired of walking? Your car-sharing apps won’t work here on the Coast. Instead, you can hail a ride with River Cities Taxi, your best bet for exploring the natural wonders beyond Florence’s city center. Bike travel — If you intend to bring a bike with you, be aware that Pacific Crest Bus Lines buses between Eugene and Florence do not accommodate bikes; Bolt Bus allows bicycles as long as there is room in the storage compartment. For service, Bikes101 is the only local bike shop. Leave no trace — No matter where your car-free travels take you, be sure to practice leave-no-trace ethics. Stay on designated trails, leave what you find where it’s at, respect wildlife and be considerate of locals.